We also offer free tours of the ranch to guests and their families so that they can witness first hand some of the many animals that we have on our ranch. Of course, our most popular activity is "more hunting." If you have already bagged your Elk or Trophy Whitetail, try your hand at a Wild Boar or Corsican Ram. It’s not uncommon for our guests to leave with a whole roomful of exotic mounts. Once you are done with your hunts, you may want to consider some of the nearby attractions. High Adventure Ranch is now offering a Summer Vacation Package during the months of May, June, July and August of each year. The ranch is closed for maintenance from mid-June to mid-July 2018. Come enjoy the tranquility of staying in your own Private Cabin or Lodge in the beautiful Ozark Hills of South Central Missouri. Imagine spending time in the outdoors with your loved one(s) while seeing Majestic Red Stag from New Zealand, Rocky Mountain Bull Elk, or Magnificent Midwestern Whitetail Bucks scoring up to and over 200 B&C! During your sightseeing tour you may also encounter a herd of Buffalo or our rarely seen Exotic Deer, such as Sika, Axis, or even Blackbuck. High Adventure Ranch has many head of game, so take advantage of this Safari Big Game atmosphere at our truly unique ranch. Our newly constructed Cabins sleep parties of 4 to 8. Each has central air, one or more bathrooms, and spacious kitchen quarters (includes refrigerator, oven, microwave, coffee maker, pots & pans, all utensils, and a table for dining). All bed linens and bathing towels are also provided. The best part of either is the breathtaking view. You will be able to admire the Big Game Animals as they approach the large lake, located just fifty yards away. 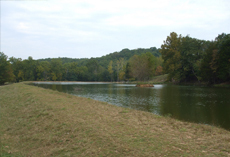 The lake is well stocked and our guests are invited to try their luck with the Bass, Bluegill, Crappie, or Catfish. The lake is catch-and-release, and don’t forget to bring your own Rod/Reel & Tackle! You do NOT even need a Missouri Fishing License! The Cost is $150 per night per person which includes meals. Kids 5 and under stay FREE. NO Pets are allowed. Plus Sales Tax. A deposit of $100 by credit card is necessary to reserve your dates, no matter how long you stay. A minimum stay of 2 nights and a minimum of 2 people! Guided sightseeing tour of the Big Game Ranch. A guide will pick you up in a 4x4 and give you a 1-hour tour of the entire ranch. Keep in mind you will see more game if you schedule this with your guide early in the morning or late in the evening. A gratuity of $20-30 would be a nice gesture. Unlimited Fishing. 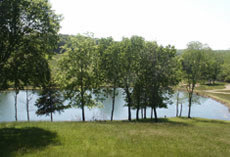 You will have access to the large well-stocked lake that sits just 50 yards from your doorstep. NO fishing license required! Recommendations of local Wineries or Canoe Trip Destinations. Some of the most beautiful and most popular Canoe or Raft trip locations in Missouri are located just 10-20 minutes from the ranch. Bass Pro Shops (World Headquarters), Silver Dollar City, and world famous Branson (Country Music Capitol of the World) are all located within 3 hours of the ranch. Peace & Quiet! Some people may say there is not much to do?? Isn’t that the point of it all? Give us a call to check availability, or fill out our contact form. And what better way to take a look at our ranch and its accommodations? You will be ready to book your next Big Game Hunt before you even leave the ranch!